Will shared value disappear? 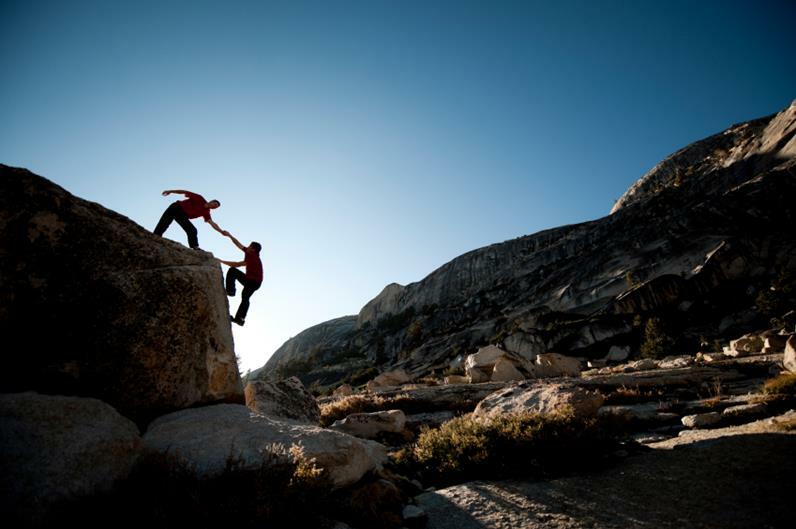 This question was recently posed to ‘Creating Shared Value’ co-author Mark Kramer and his response whilst somewhat alarming gave us at the Project cause for reflection about shared value and our role as an organisation in it. Mark’s ultimate goal is for the term to become completely integrated into processes and decision-making—hence “disappearing.” Does this then mean that our objective as an organisation is to disappear? The simple answer is yes. If we have been successful and in 5-10 years shared value becomes “simply the way of doing business,” rather than a fixation on implementing the approach, then the role that the Project plays in promoting shared value becomes obsolete. Before that time, however, there is much to do and this month’s edition is filled with opportunities for you to engage in shared value today. Join Nestlé’s live ‘Creating Shared Value’ Global Forum webcast from Thursday 9 October or sign up now and engage in an online conversation via the Shared Value Initiative Community. Consultant Phil Preston outlines five ways for your organisation to consider creating shared value. How will you engage? We are also delighted this month to welcome new members Bendigo and Adelaide Bank, National Australia Bank, Nestlé Australia, Phil Preston, Social Ventures Australia and YMCA Victoria. We are very much looking forward to working with these organiations as they realise their shared value potential and contribute to the learning and development of shared value as a global business practice. 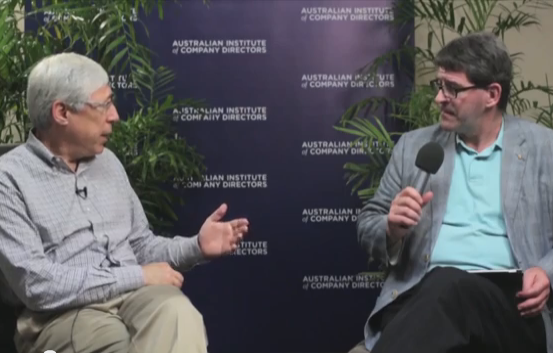 At the AICD Company Directors Conference this year Peter Yates AM, Chair of the Shared Value Project sat down with Mark Kramer, co-author of ‘Creating Shared Value’ and co-founder and Managing Director of FSG, to discuss all things shared value in Australia, local examples such as NAB, AIA Australia, and Nestlé, igniting the growth agenda, the launch of the Shared Value Project and the importance of this regional partnership with the Shared Value Initiative. 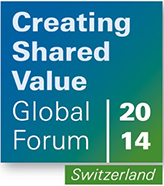 Join Nestlé on Thursday 9 October via live webcast for discussions on the changing role of business in society at the ‘Creating Shared Value Forum’ in Switzerland, co-hosted with the United Nations Conference on Trade and Development (UNCTAD). You can watch all the sessions via live webcast in English, French and German, and submit your questions to the panellists. The past couple of months have signified the momentous development that the Shared Value Project has gone through this year, establishing a network and a membership base of Australia’s leading companies and individuals practicing shared value. We are delighted to announce our newest members Bendigo and Adelaide Bank, National Australia Bank (NAB), Nestlé Australia, Phil Preston, Social Ventures Australia (SVA), and YMCA Victoria who all have been at the forefront of shared value in Australia, applying the strategy as well as raising the profile of the concept. Phil Preston, a community engagement strategist and member of the Shared Value Project, outlines five ways to help kick-start your shared value strategy creation process. Phil highlights how shared value differs from traditional corporate social responsibility, and provides specific shared value entry points and Australian examples in order to help you pinpoint what could provide the greatest opportunities. 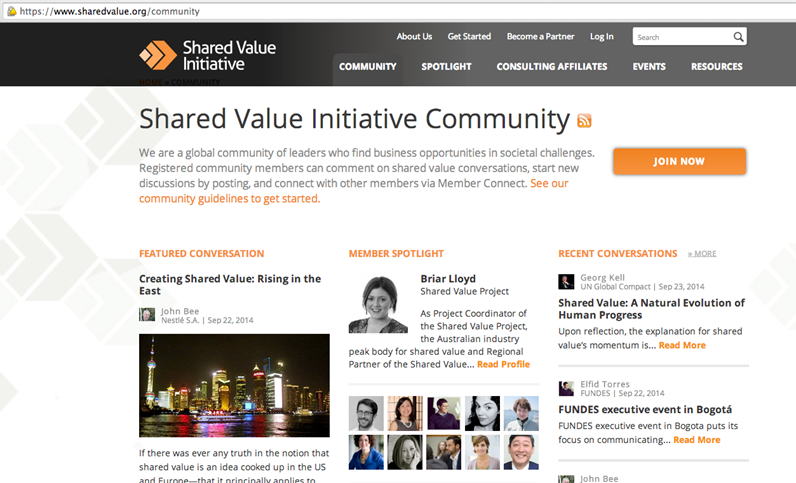 The Community page on the Shared Value Initiative website is an online global forum for users to register and engage in topical global shared value conversations. It allows individuals interested in shared value to become contributors and create posts in order to share perspectives and engage others in new ways of thinking about shared value. Mark Kramer, Founder and Managing Director of FSG recently made the exciting announcement of a new executive education course on creating shared value to be offered at Harvard Business School, December 10-12, 2014. 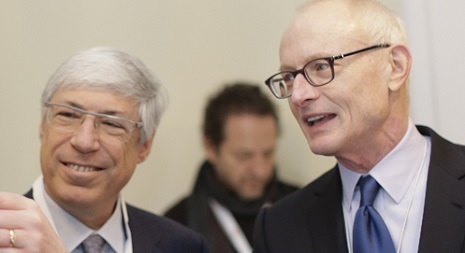 This is the first time that he and fellow ‘Creating Shared Value’ co-founder Professor Michael Porter—along with other Harvard faculty—will develop and teach a 2 ½ day course on this topic. The course is intended for senior corporate executives in strategy, operations, and new business development, as well as select leaders from NGOs and government. There is an exciting program of events and launches over the coming months amongst the Shared Value Project network. Keep up to date with what's ahead for 2014-15 via the calendar on our website.